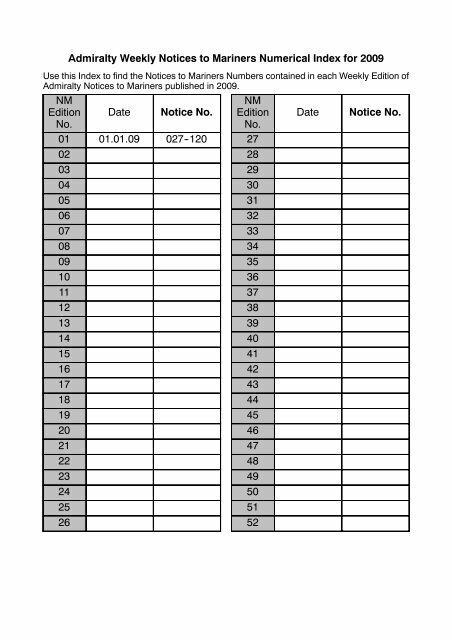 Admiralty Weekly Notices to Mariners Numerical Index for 2009 Use this Index to find the Notices to Mariners Numbers contained in each Weekly Edition of Admiralty Notices to Mariners published in 2009. NM Edition Date Notice No. No. 01 01.01.09 027--120 02 03 04 05 06 07 08 09 10 11 12 13 14 15 16 17 18 19 20 21 22 23 24 25 26 NM Edition No. 27 28 29 30 31 32 33 34 35 36 37 38 39 40 41 42 43 44 45 46 47 48 49 50 51 52 Date Notice No.